Interstate 15 cuts through the northwest corner of Arizona (Mohave County), separated from the rest of the state by the Grand Canyon. It passes through the Virgin River Canyon, one of the engineering marvels of the Interstate Highway System. Interstate 15 was part of the 1958 Interstate Highway system plan. 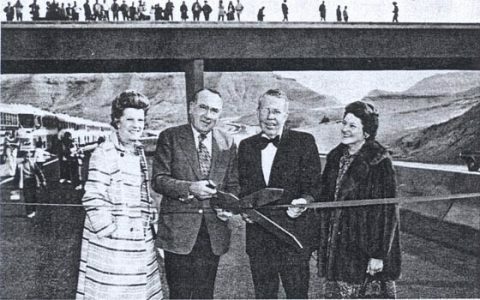 The first leg constructed was the simplest one in Arizona, between Mesquite, NV and Littlefield, AZ, replacing US 91. 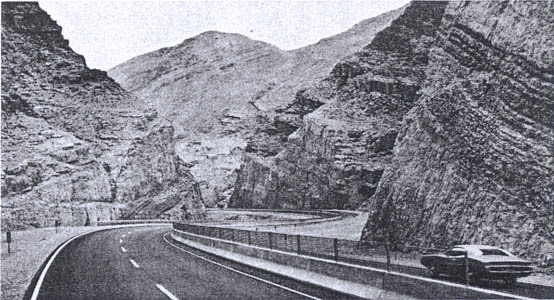 Between Littlefield and Utah, however, Interstate 15 was to follow a new alignment through the Virgin River Gorge. Despite objections from the state of Arizona, who wanted the road placed 2 miles north of the gorge for cost reasons, the Federal Highway Administration (FHWA) insisted on the road going through the previously-roadless gorge, due to the scenic beauty of the gorge. The section from Mesquite to Littlefield was constructed between 1961 and 1962, and opened to traffic in January 1963. Due to engineering troubles, the section through the gorge was delayed, with the first contracts awarded in 1966 (after completion of the road northeast of the gorge). In December 1966, the Federal government cut highway funds back 17% due to the Vietnam war. Arizona halted all work on I-15 through the gorge as a result, due to the project having no benefit to the state. Utah had already completed the connecting section of I-15 between St. George and the Arizona state line, and found itself in a dilemma. Due to the importance of I-15 to Utah, and to avoid reconstructing US 91, Utah advanced portions of their federal highway funds to Arizona in April 1969 to allow completion of I-15. By February 1972, the majority of the freeway was completed. The Virgin River had to be rechannelled twelve times during construction. During early building tests, a 50 foot long pile was driven into what was thought to be bedrock, only to have sank without a trace by the next morning. The Upper and Middle Gorge sections (approximately miles 15-26) were the first two to be built, with the last section being the Lower Gorge (approximately miles 11-15). The 3.82 mile section of the Lower Gorge, where the gorge narrowed to as little as 150 feet in width, cost $13.8 million dollars to build, making this the most expensive section of Interstate highway until the completion of the Big Dig in Boston. The freeway opened December 14, 1973, rendering US 91 obsolete and leading to it's decommissioning in 1974. Old US 91, now a county road, remains driveable from Littlefield to St. George. The Virgin River is bridged six times inside the gorge, with the first bridge (traveling eastbound) crossing the river lengthwise.